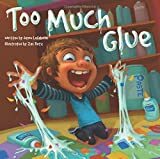 “Too Much Glue cleverly captures young children’s love of art, hands-on construction, and messy glue and combines it all with the wonder of boundless imagination. . . .